Obama came to the speech from the bedsides of those who had been wounded. Their message to him was one of dedication: “They believed, and I believe, that we can be better.” This rang a bell with me. It reminded me of the lesson of the fallen that Lincoln took from Gettysburg—“that from these honored dead we take increased devotion to that cause for which they gave the last full measure of devotion.” At Gettysburg Lincoln might have been expected to defend the North and blame the South—which is what Edward Everett did in the speech preceding his. Rather, the bulk of his speech was given to praising the dead and urging others to learn from them. I don’t wish to violate this spirit, which is perhaps one reason I have been mute for the past week. We’re all being told we need to be civil. Okay, I’m being civil. Here we go again. Those selfish athletes, liberal parents, and their self-centered children! Really? Is that the problem? What about limited gun control? What about a political establishment that won’t even talk about guns, except to say that guns don’t kill, people do. What about huge corporate and wealthy individual support for mental Neanderthals who support the rich getting richer, the poor getting poorer, and the elimination of regulation? What about the banishment of science, reason, and logic in favor of faith in a god who (proponents say) assures us that we can do whatever we wish to the earth, so let’s not worry? And what about the leading cable station airing lies 24 hours a day, claiming to provide fair and balanced coverage when it is in fact an arm of an extreme political party? (I know, I have it backwards. The party is in fact an arm of it.) And what about the mainstream media not being willing to call lies lies, but preferring to hide behind “he says, she says” coverage? Sure, let’s be civil. But let’s be honest too. Actually, now that I think back, I realize that in counterpoint to David Brooks, Paul Krugman had a column last Thursday that is much closer in its thoughts to my own views. No surprise that I would agree with Krugman over Brooks. But he seems to be addressing reality in a more serious way. Today’s G.O.P. sees much of what the modern federal government does as illegitimate; today’s Democratic Party does not. When people talk about partisan differences, they often seem to be implying that these differences are petty, matters that could be resolved with a bit of good will. But what we’re talking about here is a fundamental disagreement about the proper role of government. 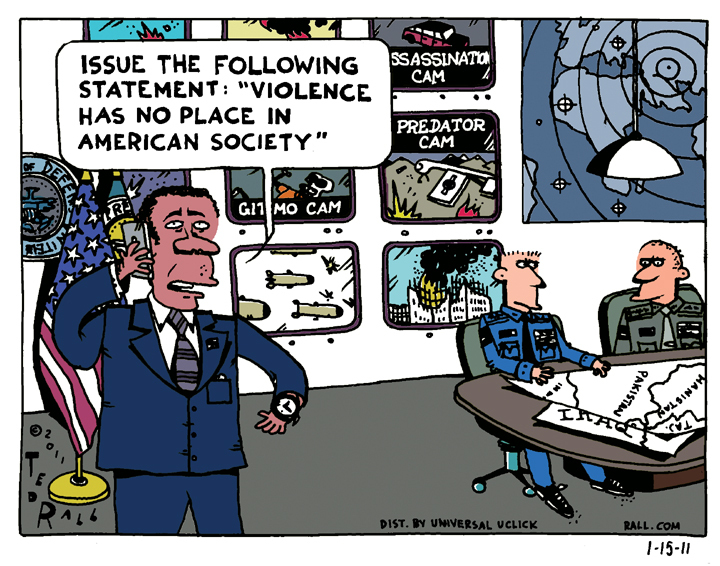 As for the Ted Rall cartoon at the top — sorry, I couldn’t resist. It is telling commentary in its own way, about Obama and about our country.